The world is best explored on foot. And a trip to Costa Rica is not complete without a hike in at least one of its top destinations. Costa Rica hiking tours are very popular for those who enjoy being engulfed by nature, pushing their physical limits, learning about local flora and fauna and take in some well-deserved, breath-taking views. True Costa Rica nature vacations are more than just a nature retreat – They should introduce you to fantastic destinations in the form of nature walks. From deep jungle trails in the mountains to the evergreen fields of the lowlands, Costa Rica is meant to be explored on foot! Do you need some inspiration? Here are some of our top picks. Although technically not a full-on hike, your Costa Rica experience won’t be complete without a canopy walk. Here you can experience the jungle from a very unique perspective – above! An excellent example of a canopy bridges tour in Costa Rica, is Selvatura in Monteverde. The Selvatura experience includes jungle trails and eight suspension bridges that take you into, over and under the tropical cloud forest where many tourists hope to spot birds and wildlife like sloths or Quetzals. Monteverde Costa Rica has a lot of sights to offer including a hummingbird garden where you are guaranteed a perfect picture opportunity of these dazzling creatures. Zip Lining in the Cloud Forest (unique). Manuel Antonio National Park is an excellent place to visit during both the low and high tourist seasons. During the high season, however, the trails can get crowded with hordes of full gear nature lovers hoping the enjoy its biodiversity to the fullest. Manuel Antonio National Park is best experienced with a government qualified nature guide who will help you spot all the elusive animals. 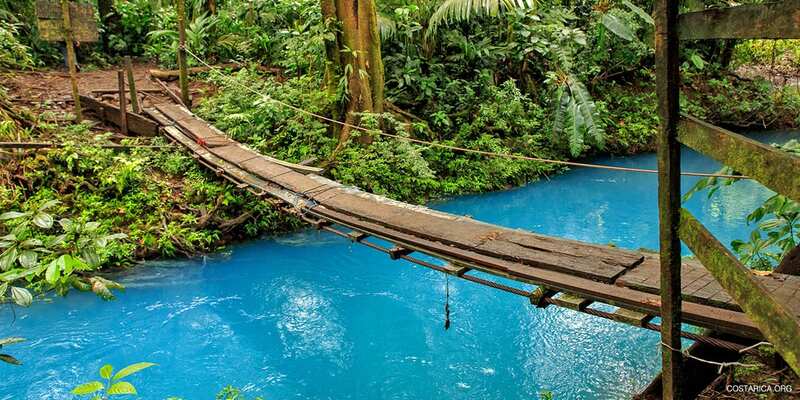 This oasis of nature along one of the most beautiful beaches in Central America, is definitely worth a visit. Arenal Volcano National Park is the number one destination for most of us. The conical beauty together with La Fortuna Waterfall are a sight you can’t miss on your visit to Costa Rica. You can choose from several hiking trails that leave from the entrance of the park, some only taking 30 minutes, some taking a couple of hours. Solo hikes on the trails are permitted but you can also easily arrange guided hikes in La Fortuna. The Arenal Volcano National Park is also a good place to spot animals and plants. Hiking through the park you are likely to see monkeys, tapirs, snakes and deer. Some notable flora includes higuerones, orchids, ferns and guayabo de monte. A 480-step journey down a jungle covered canyon will lead you to a tall, powerful waterfall and natural swimming ponds of La Fortuna Waterfall. Here you can have a well-deserved rest and even enjoy a swim. Make sure to get here early enough since it can get pretty crowded from mid-morning to afternoon! The Cabo Blanco Absolute Natural Reserve is a hike that requires moderate to good condition and plenty of water, especially during the dry season months, when it is best to visit. At a slower pace, the Cabo Blanco trail can be completed in about 5 hours. This is an excellent trail that involves a three-hour journey through a jungle where the tropical dry forest transitions into the tropical rainforest. In Cabo Blanco, elements of both ecosystems can be appreciated just steps away from each other in a unique display of ancient giant trees. Monkeys, deer, and wild turkeys are usually your observant bystanders as you walk through their territory. The ultimate reward of this beautiful hike lies at the end of the trail at Cabo Blanco beach; the solitary and pristine corner of Costa Rica’s Nicoya Peninsula and home to a great number of brown pelicans and ocean side beauty. Corcovado National Park is Costa Rica’s wild child and part of the Osa Peninsula. The biodiversity Costa Rica is so known for will reach a climax here. Within Corcovado you can find 13 major ecosystems, all monkey species, all sea turtle species and over 40 frog species. In addition, there are 100 butterfly species, 10,000 insect species, several types of snakes, over 25 lizard species all six feline species, tapirs, crocodiles and over 400 bird species including the scarlet macaws! Only explore this park with a licensed guide! The jungles are thick and wild and some of the wildlife like peccaries or even Africanized bees can be dangerous to encounter on your own. If you crave a physical challenge combined with some of Costa Rica’s less crowded locations, you have two great options. If you are staying close to Liberia, you can hike to the summit of the Miravalles volcano. Even during high season, you could be the only person there! If you are staying in the San Jose area, consider visiting the Barva Lagoons. A tough hike will be rewarded with the sight of misty, green lagoons conjuring up a Jurassic Park– like charm. Are you curious about more stunning hikes near San Jose? Read our blog about day hikes from Costa Rica’s capital! Cahuita, Puerto Viejo. Favorite. Nature Guide, Drinks, Snack, Meal, Transfer, Entrance Fee. Manzanillo, Puerto Viejo. Favorite. Nature Guide. Monteverde. Family, Nature Guide, Equipment.